What caused these bent hypocotyls? Click Read More to make your answer. LL: Use high water volumes for Liberty and use the Group 1 tank mix. RR: Use the 180 ae rate of glyphosate if you plant to hit grassy weeds first and follow up later. CL: Consider Odyssey DLX for enhanced grassy weed control in Clearfield canola. If newest leaves are 25% defoliated and flea beetles continue to feed, then spraying is probably warranted. If newest leaves are growing fast and virtually untouched, spraying is probably not necessary — even if the cotyledons sustained heavy damage. This crop will likely outgrow the threat. 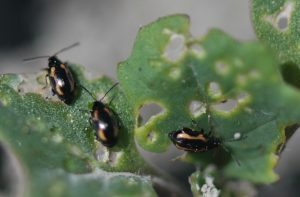 Diamondback moth and flea beetle damage can look similar in some cases. So can wireworm and cutworm underground feeding. Look for the damage and the insects before making a final spray decision. If an insect or disease threat is present at economic thresholds and within the weed control window, applying herbicides with other pest control products can add to production efficiency and cost management. Before mixing, make sure all products are compatible. And if they are compatible, they may have strict rules for mixing order. Keep it simple — compare only treated and untreated strips. Mark the strips and take them to yield. Do an economic analysis. Work with other agronomists and other growers and compare results. No research has been conducted to show reliable ways to break up crusting and free the crop. If a few plants have emerged, it may be best to leave them be. One to 2 plants per square foot are better than none. Fine sprays may provide better leaf coverage, but spraying weeds early is more important than getting good coverage of the leaf. Coarse nozzles, low boom heights and appropriate water volumes are key. Alberta Farming Smarter insect crop walk, Thursday, June 7 in Lethhbridge. Canola Crop Walk, Wednesday, June 13 in Lethbridge Controlled Traffic Farming Crop Walk with Robert Ruwoldt, Thursday, June 14 in Rolling Hills.